A large castle sits high on boulders, and is surrounded by the moving sea. 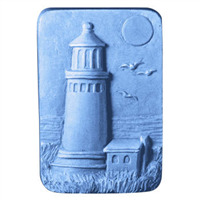 The Island Castle Soap Mold is constructed of plastic and intended for molding soap. Bar Depth: 1" Bar Length: 3 1/2"
COMMENTS: I have been making cp soap for well over a decade and have used all kinds of molds. 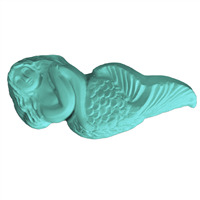 I recently have begun using plastic molds because of the styles offered and feel they work well for my business. This beautiful mold was a freebie, and I had wonderful success with it. My soap recipe does include plenty of hard oils and sodium lactate for these kinds of molds. I also gelled the soap which I feel helps the release factor. In addition, I put it into the freezer for a half hour before popping the soap out. Not a detail was marred! 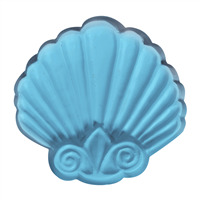 I will add that I think fragrance oil choice can affect the release factor in plastic molds. I have been working with plastic molds extensively for the last few months and notice a couple of fragrance oils routinely make release more difficult. Most of the time the soap pops out fine the next day. This has to be the most detailed mold I've ever used for cp, but I had no problems. My soap came out beautifully! I will probably be ordering another one.